Welcome to the Apogee Awards, a tribute to the success of 27 C-level executives throughout South Florida. The region has many business awards programs, but this one continues to be unrivaled. Rather than having an awards program for each position, such as a CEO awards program one month and a CFO awards another month, we bring in the entire C-suite for our awards program. This year, we tweaked our program by adding vice presidents, recognizing their key role in leadership and driving change at many organizations. 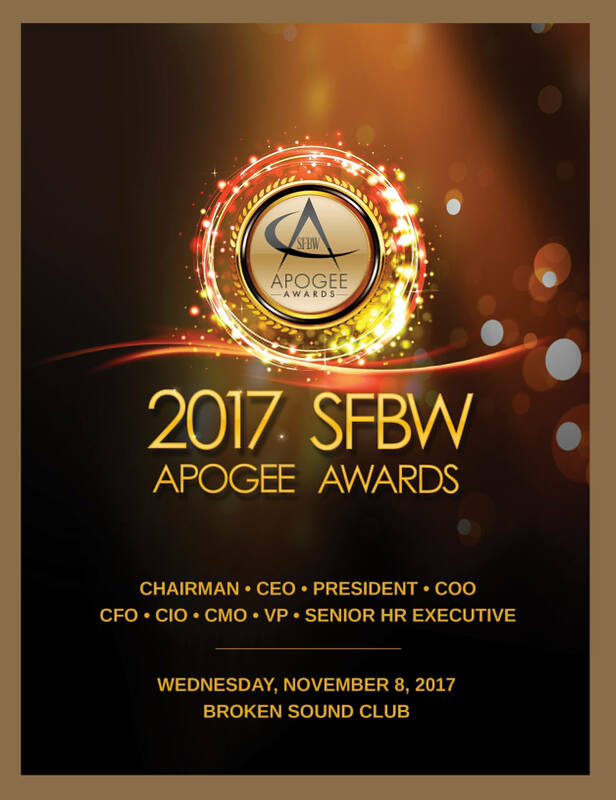 As Apogee hits its fourth year and SFBW continues to grow in prominence, we find increasing excitement about our annual event. There was so much buzz this year that we moved to a larger venue, the beautiful Broken Sound Club in Boca Raton. We also changed things up with a sit-down dinner. As I write this several weeks before the event, we are close to capacity even with the larger space. Beyond recognizing excellent members of the C-Suite, we think there is a huge benefit for these savvy, driven achievers to be able to share important experiences, challenges and lessons learned. South Florida has a broad geographic sweep, so it is rare to have this group all in one place at one time. We’ve been gratified to get feedback about how many new business relationships and friendships have been created by Apogee and our other events, including CEO Connect and Veterans of Influence. To get our nominations, we sent emails and did outreach throughout the South Florida business community. Thank you to our marketing team and editorial staff for helping with research and selecting the candidates. All of this would not be possible without our sponsors. Special thanks goes to presenting sponsor StevenDouglas, and our Gold Sponsors C3 Cloud Computing Concepts, Celebrity Cruises, EisnerAmper Accountants & Advisors, Fort Lauderdale Executive Airport, Levatas, Optime Consulting, and Broken Sound Club. Levan is a chairman and CEO. He has been chairman of four NYSE listed companies. Since the sale of Bank Atlantic to BB&T in 2012, Levan’s team has transformed BBX Capital into a diversified company that is one of the fastest growing in Florida. Levan has received Habitat for Humanity’s Spirit of Humanity Award, NSU’s Entrepreneurship Hall of Fame Award, South Florida Junior Achievement Hall of Fame Award, the Greater Miami Chamber of Commerce’s Cutting Edge Award,, and Ernst & Young’s Entrepreneur of the Year award for Florida. Farra is chairman of the Tax and Accounting Department at MBAF and leads its team of nearly 190 highly-skilled tax professionals working with clients both domestically and internationally in a variety of businesses ranging from banking and manufacturing to wholesale/distribution, real estate, and healthcare. Farra oversees the firm’s 13 offices and is a member of the firm’s executive committee. He was inducted into the Hall of Fame by Miami-Dade College in 2009, received the Excellence in Accounting Award in International Tax from the South Florida Business Journal in 2005, and was presented with the Twelve Good Men Award from the Ronald McDonald House. As chairman, Garcia leads the board by establishing company visions, goals, strategy and oversees the implementation of those elements. His leadership is dynamic in nature and he listens as well as directs. He fuses the experience of veteran team members with the ingenuity and technical skills of the up-and-coming generation. His awards and honors include: South Florida Business Journal Ultimate CEO, Palm Beach County; Sun Sentinel Excalibur Award as Small Business Leader of the Year; Byron Snyder Award, Fort Lauderdale Historical Society; South Florida Business Journal Up and Comers award. Ron Antevy teamed up with his brother, Jon, in 1998 to lead e-Builder. Under his leadership, the company has consistently grown from 25 to 35 percent annually, profitably and without debt. Prior to e-builder, Antevy held various senior management positions in the construction and environmental services industries, including regional director of operations for Waste Management, where he managed 19 facilities with 200 employees and annual revenues in excess of $150 million. He is a graduate of the University of Florida College of Engineering with a degree in cicil engineering. MIAMI LIGHTHOUSE FOT THE BLIND AND VISUALLY IMPAIRED, INC.
Jacko is one of the only CEOs in the country who is blind; however, her vision has enabled the Miami Lighthouse to increase its number of participants 33-fold during her 12-year tenure. She originally came to the Lighthouse in 2001 as a client. Before her permanent appointment as president and CEO of the Miami Lighthouse in 2005, Jacko served as a member of the board of directors, treasurer, and acting president and CEO. She has introduced several innovative new programs under her leadership. Zietz is the founder and CEO of TouchSuite, a financial technology firm, and its affiliated companies. Prior to TouchSuite, he was a corporate attorney specializing in structured finance with a New York-based law firm. He earned a bachelor of science degree from the University of Michigan, then went on to receive his JD from the St. Thomas School of Law in Miami where he finished first in his class. In 2015 he received the EY Entrepreneur of the Year award in Florida, and in 2014 he was named one of South Florida’s Ultimate CEOs by the South Florida Business Journal. Roy founded his firm in 1990 and is the president, which acquires and develops prime waterfront property, providing luxury residences and improving the overall aesthetics of previously underutilized sites. With more than four decades of entrepreneurial experience, Roy first achieved success by developing Canada’s third largest portfolio of retirement homes and senior care facilities. A Quebec native, he moved to South Florida in the 1980s. Today, Ocean Land Investments is revitalizing waterfront property in the East Las Olas Isles of Fort Lauderdale. He recently announced plans for a luxury senior living facility at Riverwalk as well. Inigo Arnid has created a local family legacy of smart evolution from residential real estate to hospitality that today positions 40-year-old Key International as a key player behind South Florida’s real estate and tourism empire. As co-president, Ardid has strategically executed acquisitions and completed developments in several prime sub-markets and coastal regions in the southeast United States. Ardid has provided generous, private donations to St. Jude Children’s Research Hospital and St. Stephen’s Episcopal Day School in Coconut Grove. As president, Weissman is responsible for the growth and expansion into new markets, oversight for individual stores, profitability and directing all retail operations. 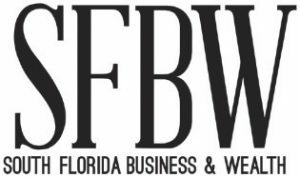 The last recession was the company’s greatest challenge, but she led the way by to ensure its survival, and is now expanding throughout Florida, succeeding in the retail space while others are struggling. She is a Women in Leadership Award (Executive Women of the Palm Beaches) nominee, and received a 2006 Enterprising Women of the Year Award. Creegan began working at Youfit before it was even named Youfit. He started off as a part-time, minimum-wage employee back in 2001 when the company had only three locations. Youfit now owns 115 clubs in 14 states, and Creegan has dedicated his life to the company, having ascended to the role as one of its top executives. A graduate of Florida Atlantic University, with a bachelor’s degree in business administration, Creegan has served in nearly every management position in the Youfit hierarchy. As chief operating officer, he leads the operational, managerial, and marketing strategy of this large, national organization. Rubio has more than 25 years of executive management experience. Prior to his current role as COO at Douglas Elliman Florida, he was COO at ONE Sotheby’s International Realty. He also has held positions including executive vice repsident for Realogy’s Global Services Division, where he was responsible for developing Sotheby’s International Realty as well as the company’s five other real estate brands, including Better Homes & Gardens, Century 21, Coldwell Banker, Coldwell Banker Commercial and ERA. He has been with Douglas Elliman since April 2015. Douglas Elliman is the nation’s fourth-largest real estate firm with a network of more than 7,000 agents and 110 offices. Douglas Elliman Florida has grown to 1,000 agents with 21 offices. Rubio holds a bachelor’s and master’s degree in business administration from Columbus University. Michael Diaz has served as COO since the company’s launch in 1999. He began his hotel career in 1993 at Servico, serving roles in operations, acquisitions, projects and purchasing. During his tenure at Servico, the company grew from 32 hotels in 1993 to 180 hotels in 1998. In his current position, Diaz is responsible for nearly 50 hotels, with a total of more than 9,000 rooms in 15 states. He oversees approximately 4,000 associates. He creates plans and procedures for each hotel based upon its market. He establishes policies promoting the Driftwood culture and vision. Ziegler has been CFO at BioMatrix since January 2013. He has extensive experience working with small/middle market privately owned companies. His specialties are financial forecasting and budgeting, cash-flow forecasting, financial and operational analysis, team building, workflow, process improvements, and driving profit improvement initiatives. He received his MBA in finance, as well as a bachelor’s degree in finance, at Florida Atlantic University. Ziegler has been described as being a natural leader who knows his way around financials. He can collaborate, as well as make tough decisions and inspire others. Knight joined Jackson Health System as executive vice president and chief financial officer in 2010, and has been integral in leading the system’s dramatic financial turnaround. He has earned multi-million dollar surpluses every year since 2012, all while improving clinical care, patient volume, and customer service. He won the South Florida Business Journal’s CFO Awards for Turnaround Achievement in 2014. He earned an undergraduate degree in business administration from Baylor University, and his MBA from Florida Atlantic University. Corredera is an international senior executive skilled in financial transformation. She joined Image Skincare in 2014. As CFO she is responsible for the financial statements, treasury, investments, risk management and human resource functions in the company’s rapid growth environment. She is a member of the company’s charitable foundation Care for Skin, benefiting children who have suffered skin injuries. She is a CPA with extensive experience spearheading financial expansion, acquisition, integration and restructuring strategies. Taffet joined USG&E, a leading energy supplier, as CIO in December 2007. He oversees the management and development of all business and information technology. In addition to day-to-day management, Taffet is responsible for the technology transformation that has matched the company’s growth as it has doubled in size for six years. Taffet was recently recognized by South Florida Business Journal as CIO of the Year Finalist. He received the 2012 Universal Access Award in the individual category from the South Florida Digital Alliance for his long list of accomplishments. Grillo has more than 20 years of leadership experience in IT services, including executive management, strategic consulting and project management. He took office as the vice president of IT and CIO in June 2011. He leads a division of more than 250 IT professionals. He is the 2013 winner of the Education category of the South Florida Digital Alliance Awards. He has also been featured in Hispanic Executive for his work with business intelligence and mobile technologies. He holds a bachelor’s from FIU and a master’s in finance from Nova Southeastern University. As CIO and chief data officer of NCCI, Spears is responsible for oversight of all technology, application development, and the Program Management Office. In his role as chief data officer, Spears oversees the firm’s data collection, quality validation, coordination with industry groups on data reporting rules and standards, and the deployment of reporting tools for data providers. Prior to coming to NCCI, he held a variety of management positions. He received both a BBA degree in computer information systems, and an MBA at the University of Miami. Working closely with the founders and shareholders, Martinez Reyes serves as part of the firm’s leadership team. She focuses on the firm’s strategy and growth, branding, business development, client relations, and media and public relations efforts across 20 offices throughout the U.S. Her legal experience includes work for various AmLaw 100 firms including the three largest law firms in Florida. She has been recognized as an “Up and Comer” by SFBW. She holds an MBA from Nova Southeastern University with a specialty in global management. As executive vice president and CMO for Ryder System, she is responsible for leading the company’s Fleet Management Solutions, Dedicated Transportation Solutions, and Supply Chain Solutions Marketing efforts, as well as integrating the management of all marketing and brand-related activities across Ryder to drive growth and enhance brand value. She was named “Marketer of the Year” by BtoB magazine in 2005, and was ranked in the publication’s annual “Best Issue” from 2006 to 2008. Merbler is an accomplished sales and marketing professional with verifiable year-after-year success in achieving revenue, profit and business growth objectives within a start-up or turnaround venture. He has extensive experience with branding, strategy, sports marketing, corporate business development, talent management, marketing programs and membership sales, and in many other areas of expertise. Active in public service, from 2009 through 2011 he was on the Town of South Palm Beach council, and from March 2011 through the present he is chairman of the Architectural Review Board. Since 1981, Tangalakis has been a valued advisor to his clients in the area of industrial real estate in South Florida with CBRE. His expertise spans the sale and lease of warehouse distribution and marketing. He is known as an honest, hard-working and thoughtful person who is an expert at achieving maximum results. In 2016, Mattingly joined the South Florida offices of Colliers International, launching the firm’s Urban Core Division. As group co-leader, her team specializes in urban renewal, off-market sales, and assemblages across core South Florida neighborhoods. She has established herself as the premier real estate expert in downtown Miami and has been the driving force behind the market transformation from a neglected business corridor to a revitalized destination for real estate investment and community. In his role as senior wealth director at a major wealth management company, Scott was responsible for new business development in Palm Beach County. He worked with individuals and families to identify how the company’s investment and wealth management capabilities can help them reach their overall financial goals. He has more than 30 years of experience in financial and fiduciary services. Strochak received his MBA degree from the Wharton School of the University of Pennsylvania, and his bachelor’s degree in business administration from Emory University. He is active with Scripps Florida, FAU and the Jewish Federation of Palm Beach County. As HR Director, McCawley collaborates with leadership at all levels to assist with human capital needs including creating staffing and employee engagement strategies. She oversees a remote team who handles all talent acquisition and employee relations needs including investigations, employment law updates, unemployment and immigrant cases. McCawley has a bachelor’s degree in business administration from Framingham State University and a master’s degree in ministerial leadership from Southeastern University, and has done volunteer work building an orphanage. Brennan is a resourceful, enthusiastic professional with more than 20 years of human resources management experience within both non-profit and for-profit organizations. She’s held profit and loss responsibilities, and has expertise in initiating projects and programs that boost efficiency and productivity while enhancing cash flow. She is a hands-on leader with proven skills in analysis, management, strategic planning, organization, motivation, and improvement of operations through policies promoting a team-based atmosphere. She attended the University of Montana. McNeil has more than 30 years of management experience, 20 of them in the field of international development, including work in the public sector. She has a unique background of working in multiple areas of technical specialization with a common thread, leading the startup of new initiatives, projects, functions and organizations. She has held many leadership positions, including 15 years as a leader in human resources. She has lived overseas in several countries, and this background helped her develop skills in management and critical analysis.